John McCrae is best remembered as the author of In Flanders Fields, the most recognizable poem of the First World War. McCrae was born in Guelph, Ontario and served as a gunner in the South African War. He was later a professor of medicine and physician at McGill University in Montreal. McCrae enlisted quickly at the outbreak of the First World War, hoping for a position as a gunner, but doctors were in short supply and he accepted an appointment as brigade-surgeon in an artillery brigade. At the Battle of Second Ypres in April 1915, McCrae spent 17 days caring for the wounded and performing surgery on Canadian and Allied troops. 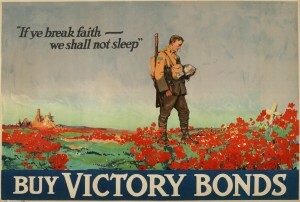 Exhausted and saddened by the death of a close friend, he composed In Flanders Fields during a brief rest. The poem was published on 8 December 1915 in Punch magazine, where it achieved almost instant world-wide fame. It captured the Allies’ belligerent mood and the requirement to “keep faith” with those who had already died. McCrae had become an internationally-recognized poet, but continued to work as a surgeon. He served in a number of Canadian hospitals during the war and pushed himself and his staff hard. McCrae was often sick but took little rest and succumbed to pneumonia on 28 January 1918. He is buried in Wimereux Cemetery, in France. McCrae’s poem is read by millions in Canada and around the world each Remembrance Day. A history museum in the Cloth Hall in Ypres, Belgium is named after his poem; the special exhibition gallery in the Canadian War Museum, Canada’s national museum of military history, is named for McCrae. 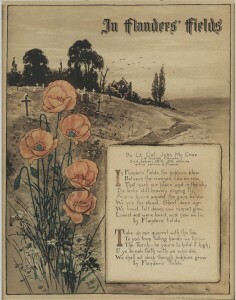 This print depicts the famous poem by John McCrae framed in a field of poppies. 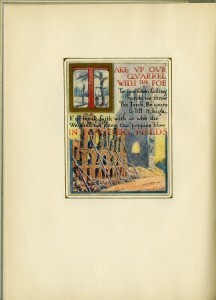 McCrae's poem was mass-produced, accompanied by images, and even put to music. The images of poppies and crosses reflect the poem's verses, but perhaps not its tone, which is perhaps more belligerent than is often remembered. This meaning has softened with time. Contemporary readers, including school children, generally encounter the work as an ode to peace or as a reminder to reflect on past sacrifices. In McRae's time, writing in 1915, the phrase "take up our quarrel with the foe" had a far more precise and political message.